Art may be a part of culture, but my culture is not your art. – arts, ink. Nothing will make me quite as angry as tourism, under the guise of a study abroad program. I am tired. Tired of seeing one too many pictures of people posing in third world countries pretending to identify with the lifestyle. Do not try to lay claim to a cultural identity that is not your own. You are a visitor and will always be a visitor because your time there is temporary. Spending a few months in Asia does not make you Asian, just like spending a few months in Africa does not make you African. A rice worker’s hat is not your prop. A kimono is not just a fashion statement. A hijab is not a decoration. 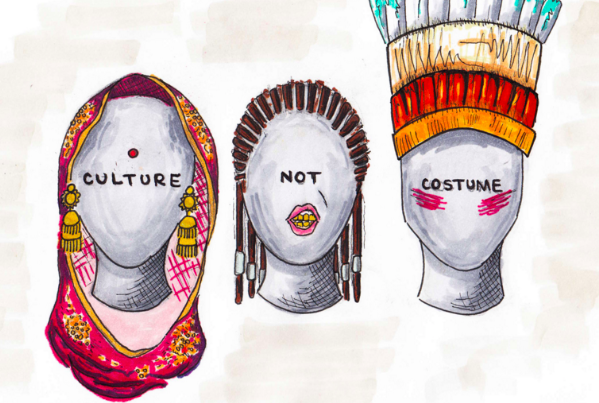 The culture of other is not a backdrop for your Instagram self-expression. Rather, engage in ethical practices of honoring, appreciating, and supporting the culture of other. Having deep appreciation for a place is so very different from using a place to create social capital for yourself. By posting appropriated pictures documenting your exotic journey abroad, you reduce another’s culture to a quick snapshot that is able to be scrolled past without a second glance. Think about what you are posting it for. For likes and comments? To cross “travel the world” off you our bucket list? To add “well-traveled” to your personality? We are in an age where everyone wants to “embrace” other cultures by posting these seemingly cute pictures, without actually supporting the people of that culture. This enables people to remain ignorant to the fact that they’re only perpetuating harmful stereotypes. To make the most of your time away, do your research. When you enter a new space, understand that you are not just bringing yourself. You carry rich histories with you—stories of the people who came before you, of the country you’re from, and of what you’ve lived. Know that your presence transcends the bounds of your body, understand what you are representing, and take responsibility for your role in your own narrative. Especially coming from the United States; it’s of utmost importance to understand your role as an American given the deep rooted and far-extending ideals of colonialism, imperialism, and globalism birthed from our early predecessors and arguably, maintained by present day power structures. Recognize your place and reflect on the assets that allow you to leave your own country. Cultural appropriation—adoption of elements of one culture by members of another culture; can be controversial when members of a dominant culture appropriate from disadvantaged minority cultures because of the presence of power imbalances that are a byproduct of colonialism and oppression. Social capital—network of connections with people that allow you to succeed in a social environment; a form of insulation or protection from adversity because of support derived from social status. Insensitivity—lack of awareness or ability to respond to something; lack of concern for others’ feelings. Exoticism—the representation of one culture for consumption by another; often involved surrounding foreign cultures with mystique and fantasy, which owed more to European culture than to the exotic cultures themselves; process of glamorization and stereotyping.